Protest march held prior to Hong Kong’s 25th anniversary vigil of the Tiananmen Square massacre. The ongoing struggle for transparent democracy in Hong Kong continues, as the last week featured significant setbacks. 2017 will bring the first direct elections for the head of Hong Kong, but it appears that the process of nomination will be rigged in order to elect candidates willing to support policies of mainland China. Candidates will need to be approved by a majority of a large nominating committee, which will likely have a conservative bias that defers to the Beijing government. Election boards do not see high-profile use in the United States, but they are a key mechanism resisting multiparty politics. They have been used to exclude many candidates for the Presidency of Iran, and are a weapon for incumbents and dominant parties. 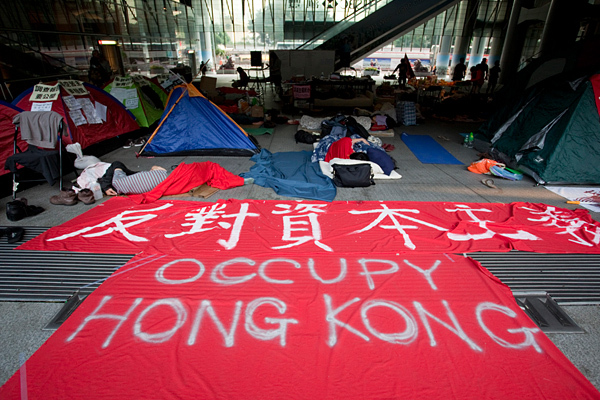 Encampment in Hong Kong for Occupy Central, 2014. When the British left in 1997 very little effort was expended towards ensuring a democratic Hong Kong. Thus the past two decades have been full of vague promises. Since no dates were etched in the political process, things have been delayed as long as possible. This has mostly benefitted pro-Beijing groups; democratic opposition can only show its full power when there are democratic elections to move in. China recently warned foreign countries against “meddling” in Hong Kong’s politics, with an article in a state-run newspaper on Saturday accusing some in Hong Kong of “colluding” with unnamed “outside forces”. Despite great wealth and geopolitical importance, Hong Kong is an ignored front in the fight for worldwide democracy. Very interesting and informing. I just wrote an opinion piece on the same topic. Would be great if you can check that out. Also would be grateful if you can follow back. Thanks!